When you look at the burnt offering and really study it; does the statement well done good and faithful servant ring a bell? As we’ve started looking into the sacrifices, I think it is safe to say that many people don’t understand the sacrificial system and choose to take the stance of well Y’shua is my sin sacrifice so all that other stuff written over there in that ‘Old’ part of the Bible doesn’t mean anything to us anymore. There is a great disconnect that the enemy has flawlessly been able to weave into the lives of many believers. I know when I first read the sacrifices I thought to myself man I don’t understand this at all but I’m glad I don’t have to do all that burdensome stuff anymore. That was my position as a believer many years ago but when I began to grasp and understand and began to connect these sacrifices to things that the Eternal wanted to teach us about Himself and His son then it began to get clearer. I feel it is safe to say that most of us like to eat. I’ve never really run across anyone who says man I just hate to eat or it takes everything within me to eat or I have to force myself to eat. We all enjoy our food. I would take it a step further and say that food, to some, is an idol or a god if you will. So when a food offering was being brought unto the Creator, what was being said was my relationship with You is way more important than my relationship with my stomach. Now I realize that several food offerings were not only consumed by the priests but the person who brought them as well but if a person has made food an idol then it is really hard to even let go of just the tiniest portion of food. So when a sacrifice was brought I see the statement being said that people were demonstrating what was truly important in their lives. Today because there currently is no temple or sacrifices I believe folks have become so disconnected from the reality and truth of what Yah wanted us to see in this system that it is easier to just say that was something for back then and doesn’t pertain to us today. See this attitude frees us up from having to study a little bit or put some time into trying to understand what is written to teach you and me about life. So let’s be very careful to not be good Hebrews, if you will, and just ‘pass over’ the verses that we don’t understand or dislike. It’s time for us to connect and go back to the foundation and start to build upon those pillars that were dug and poured many years ago. If we build upon that solid foundation or ancient path as the Scriptures refer to it then we just might not only get connected again but have a house/ministry/relationship that is built upon something that can withstand trials, tribulations, and storms. In Lev 6:9-13 we are given the instructions on how the whole burnt offering was performed. This fire was initiated by the Creator and thus very important for it not to burn out so someone was there maintaining the fire or keeping it going. This is a picture of how Yah sets us apart and then it is up to us to maintain or continue in that. For those who might disagree that it is our job to maintain that salvation or encourage ourselves when that fire begins to die down; take a look at what Israel and David did. Salvation is not a onetime event as many people in religious circles understand it. There are numerous occasions where we see multiple salvations. We live in a world where the law of entropy is constantly working. Entropy can be said to be the tendency for all matter and energy in the universe to evolve toward a state of inert uniformity as well as the inevitable and steady deterioration of a system or society. I said that to bring out the point that when you and I aren’t maintaining our set apartness it’s as if entropy begins to take its toll. Just think about it when you go a long time without talking to the Father or reading the Scriptures or fellowshipping with other believers. Many times that light within us starts getting dimmer and dimmer and it isn’t until we encourage ourselves in the things of Yah and get reconnected and put some wood on the fire; that’s when it gets stoked up again and we begin to burn with a purpose and calling that emits a light that eventually has the power to alter something whether it be a sacrifice, a person’s life, community, or region around us. So here is the background for those of you not to familiar with the altar service. There were two sacrifices a day, one in the morning and the other in the evening. From my understanding, these sacrifices will be the ones that the anti-Messiah will stop that begin the last three and a half years of the tribulation. Most of us know that through Y’shua’s death, He became the ‘Passover Lamb’, but what many religious people don’t know is about the voluntary sacrifices. They were offerings given voluntary by the people to worship and draw near to Yah so this is one of many reasons why sacrifices, in my opinion, will be re-initiated at some future time. I’ve spoken about this before but a quick note as to why they aren’t re installed now for those who may not know is because 1) there is no temple in Jerusalem & 2) no official Levite priests in place to offer these sacrifices. Specifically though what the scriptures are referring to are the morning and evening sacrifices that Yah instructed Moshe about when the tabernacle in the wilderness was built. These sacrifices were the continual sacrifices that Antiochus Epiphanies (168 B.C.) stopped when he took control of the temple and are the same sacrifices I believe that will be stopped when the abomination of desolation occurs through the anti-Messiah in middle of the tribulation period. What I am about to share may be elementary to some but I remember how profound this was for my life when I heard Monte Judah share this several years back. At 3pm were the evening sacrifice and all the other burnt offerings that people would bring. The high priest would offer the evening sacrifice and leave another priest in charge of making sure the sacrifices of the people were fully consumed and as verse 13 says ensuring that the fire would not go out through the night. 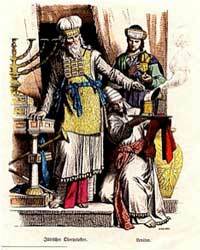 The high priest would come back into the temple before dawn the next day to prepare everything for the sacrifices again. What is interesting is that in the morning he would come in stealthily. He wouldn’t make a lot of noise when he came in, and he did this so he could come in and check on the priest that he left in charge throughout the night. He came into the temple, if you will, like a Thief in the Night. Have we heard that term somewhere before? This term has been explained to us about how the return of Y’shua is going to be like a thief in the night. Many have built theological doctrines around this one statement here. Many preach that this statement is telling us that the ’rapture’ is going to be at any moment and secretively thus referring to the way a thief comes in and robs a house during the night hours while everyone is sleeping. What I want to submit to you is the Scriptures refer to this event as trumpets blowing, mountains trembling, the earth quaking, and signs all over the place. So it’s kind of hard to ‘sneak up’ on folks when a lot of noise or a ruckus is happening. Maybe we ought to go back and adjust our understanding a bit of what the ‘thief in the night’ statement truly means. Let’s continue talking about the priest who was to keep the fire going on the altar throughout the night in the temple. We mentioned that the high priest re entered the temple very early each morning very quietly in order to check on the priest to see if the priest had fulfilled his duties or better stated to see if the priest was slothfully serving in his duties. Is the thief in the night statement starting to make sense now? This lesson taught the slothful priest about staying alert & awake fulfilling not only his job but fulfilling the instructions of Yah in this altar service. How does this apply to us today? We don’t have a temple or a functioning Levitical priesthood amongst us; how does this apply to modern day believers? Well, we must remember that we are the temple of Yah. When we study about the articles in the temple, we can see a connection to how all of these things are spiritually inside of our tabernacle today. Our high priest, Y’shua, comes in early before the dawn of the day to inspect, seeing if we have been faithful to keep a fire on the altar seeing if we’re faithfully honoring His instructions keeping the altar ready to do business with Yah. I believe when Y’shua comes back, He is going to be looking, if you will, to see if there is a fire on the altar of who we are. How’s the fire on your altar? You don’t want to be lit up by Y’shua and enter into the kingdom burnt, wounded, and naked. At least you’re in the kingdom but what a shame. Maybe it’s time for some of us to ‘encourage’ ourselves in the things of Yah if there are only a few coals left on our altar. Remember it’s our responsibility to keep that fire stoked up and burning.